Fascinating Conference on Armenian-American Heritage Draws Armenian Bar’s Armen K. Hovannisian and Harry S. Cherken, Jr.
Four hundred years ago, the first Armenian—a tobacco grower named Martin the Armenian (Hovhaness Martirosian)–set foot in a land which had not yet become the United States of America, disembarking in the Virginia colony of Jamestown in 1618. Since that time, a rich, diverse, and evolving Diasporan heritage has taken root and flourished in this country. 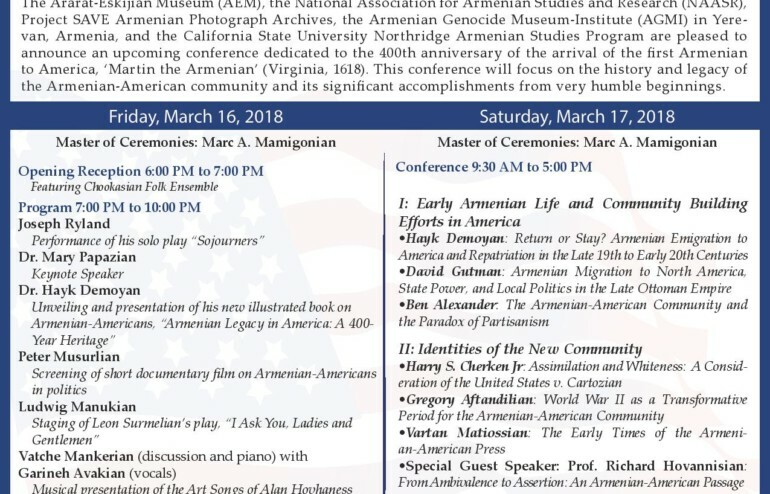 On March 16-17, 2018, an extraordinary conference marking that multi-centennial anniversary will be held at the Ararat Home in the Mission Hills suburb of Los Angeles, and professional from the Armenian Bar Association’s current and former leadership ranks will participate. Current board member and former chairman Armen K. Hovannisian will share the Association’s history, development and vision as part of a panel discussion on new challenges and strategies in the realms of law, culture and education. Charter member and former chairman Harry S. Cherken, Jr. will offer a captivating presentation about the 1925 United States v. Cartozian case which addressed the issue of whether Armenians were considered “white” for purposes of U.S. naturalization laws.